Routers, like most pieces of technology, have a lot of technical terms and specifications that leave your average person scratching their heads. Below is a list of router terms and specifications and what they mean to the average home or small business user. Router – A router’s job is to determine where the data that makes up the internet is suppose to go. There are millions of routers everywhere from large internet service providers main offices to your business or home. You can think of each router like a sign post that the little bits data look for to find out where the next place to go to get to their destination on the internet. Wi-Fi – Wi-Fi is the standard for modern computers, phones, tablets and electronics to connect to the internet wireless. Many modern routers have built-in Wi-Fi radios which emit and listen for these signals. Some popular standards of Wi-Fi are 802.11g, 802.11n and 802.11ac. 802.11g – The slowest of the widely supported standards 802.11G can transfer data at up to 54 Mbits per second. 802.11n – The most common current Wi-Fi standard and can normally transfer information between 150 and 300 Mbits per second but some units are capable of up to 900 Mbits per second. 802.11ac – The latest in Wi-Fi standard but with the least commonly supported. The speeds can range from 750 Mbits per second to over 2200 Mbits per second. MU-MIMO – Multiple user multiple input multiple output is a new technology released in some high end consumers routers in 2016 which allows a router to speak to multiple devices at the same time under certain circumstances. This technology is helpful for people who have many wireless devices. 10/100/1000 LAN – This number refers to the maximum speed of the ports on the back of the router used to connect computers wired directly into the router. 1000 Mbit or Gigabit ports are the fastest commonly availible while most consumer routers are 10/100 which support both older 10 Mbit computer network adapters and newer (and most common) 100 Mbit network adapters. Unless you are transfering a large number of files from computer to computer you will not see performance gains from getting a Gigabit (1000) vs a 10/100 Mbit router. Access Point – An access point refers to the ability for the device to act as a wireless receiver and receive connections from other wireless devices to it. 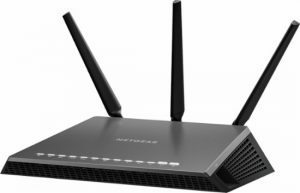 Most wireless routers include a built in access point (this is the wi-fi portion of a router) but you can also purchase a stand alone access point which can be added via an ethernet cable to a remote area of your home to serve as a second point to access your router from. The setup of these devices can be difficult so it’s recommend you contact a trained local computer technician to set this up if you are not familiar with computer networking. Wireless Repeater – This type of device receives and repeats an existing wi-fi signal. It is placed in an area between where there is good wi-fi signal and poor signal and serves to boost and repeat the signal further. The setup of these devices can be difficult so it’s recommended you contact a trained local computer technician to set this up for you if you are not familiar with computer networking.